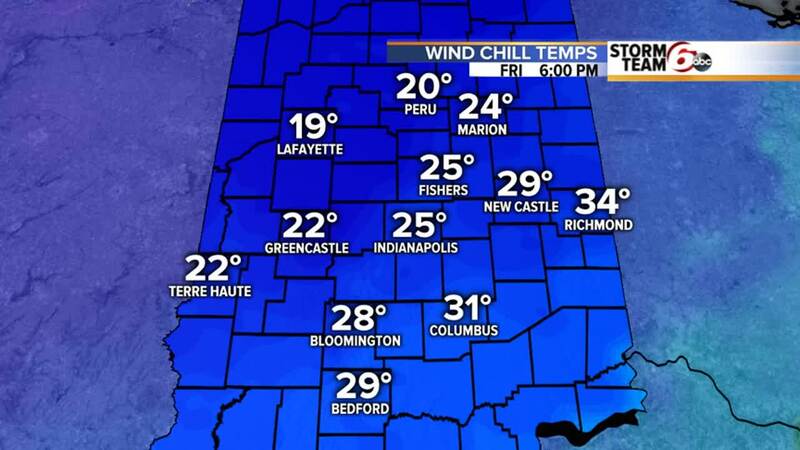 Breezy and turning colder Friday. A cold front will bring cooler temperatures back to central Indiana over the next few days. We have already hit our high for the day today and temperatures will fall into the 40s for much of the afternoon and eventually the 30s this evening. With the exception of a stray morning shower the rain has pretty much come to an end and as the day goes on we should see more and more in the way of sunshine. It remains breezy today but not as windy as it was yesterday. The weekend brings more seasonable temperatures with highs in the upper 30s and mostly cloudy skies on Saturday with the sunshine returning on Sunday. With the added sunshine highs will be back in the low 40s. Late Sunday another storm approaches for New Year’s Eve. It could briefly start as a light mix but quickly goes over to all rain with temperatures in the mid 40s. The New Year begins with cooler temperatures. Highs will be in the upper 20s to low 30s with low temperatures in the teens.